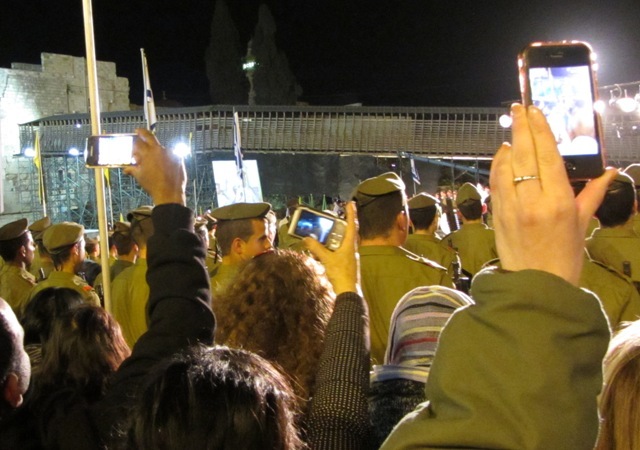 This week, many headlines reported protests involving Israeli soldiers. 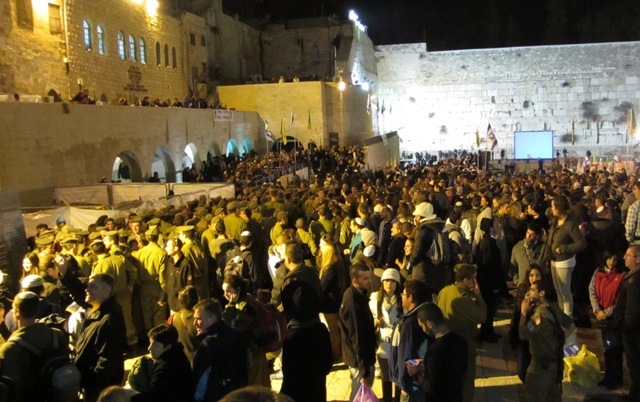 might have missed what has become a regular event in Jerusalem. 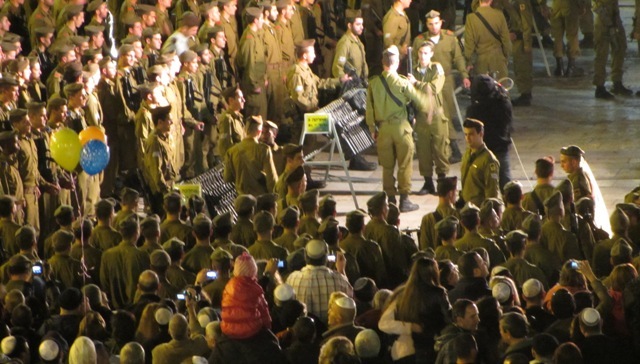 the IDF holds swearing-in ceremonies for soldiers. and smart supporters knew to arrive early to get a good spot. Nevada and New York, Baltimore and Los Angeles in the USA. sponsored by the Lone Soldier Center in memory of Michael Levin. 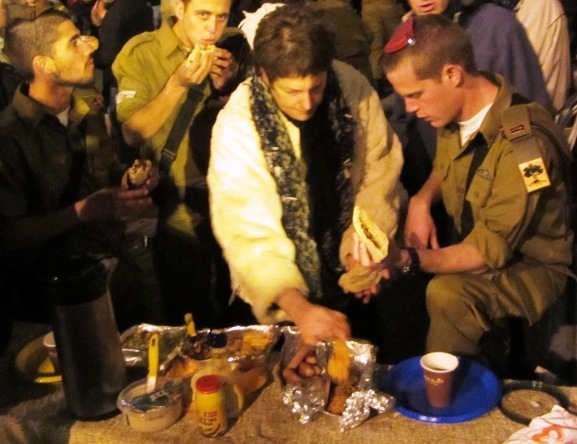 but lone soldiers do not have the families to bring them treats to eat. 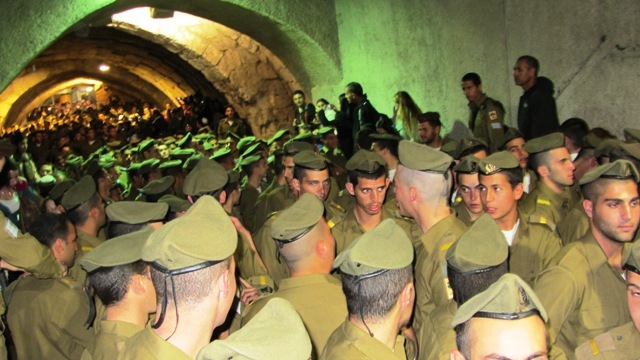 hundreds of soldiers filled the tunnel near the Kotel. Finally it was time to start…how did we find anyone before cellphones? 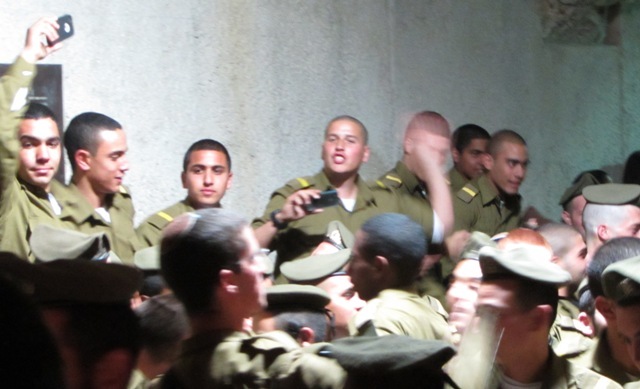 and photograph the newest graduating soldiers of the IDF. 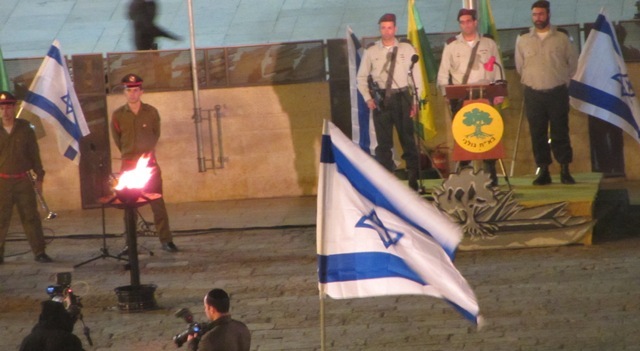 The Israeli flags flew and the flame burned brightly. Congratulations and thanks go out to all those who serve. and just typing these words brings tears to my eyes. we are filled with pride and concern. would not have to be called to serve in the army? Amen and Amen to your closing sentence!! lovely pics! 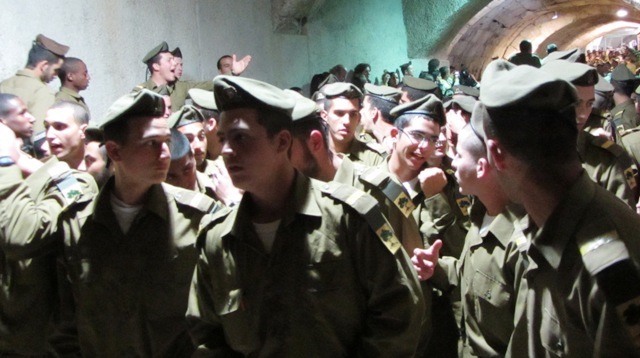 I especially love pics of the army young men. I have one son that just finished 3 yrs. 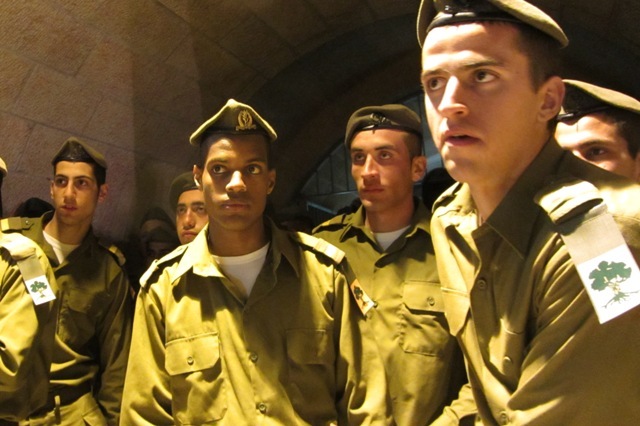 in the army. one daughter currentlly there. another son will join in the summer. the last pics was especially touching, a dad with his smilling son. So you certainly understand the pride and concern. The last pic was actually an uncle and nephew, but I also thought it was an “especially touching” pic, thanks. Beautiful! 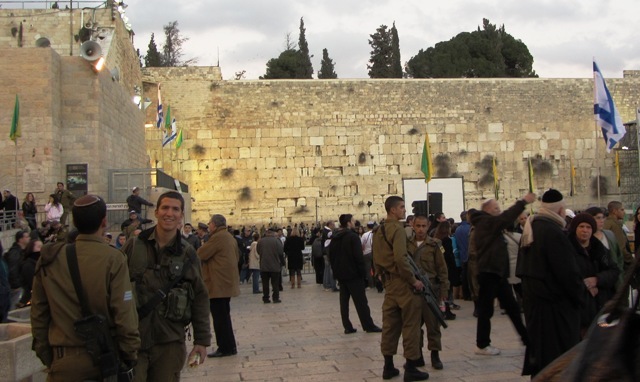 An Army tekes at the Kotel is one of the most moving “only in Israel” experiences. 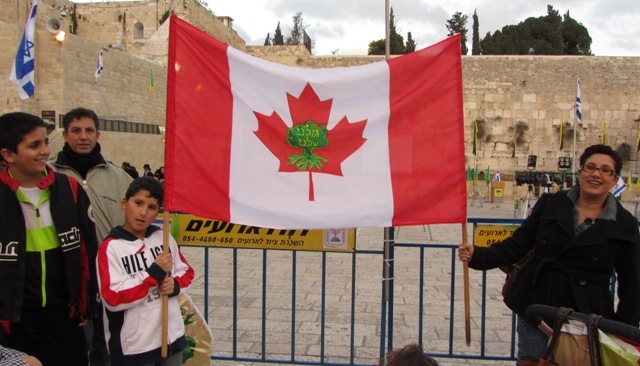 I was in Israel in ’92 and saw the swearing in ceremony at the kotel. Then we went to Ben Yehuda for some refreshments. 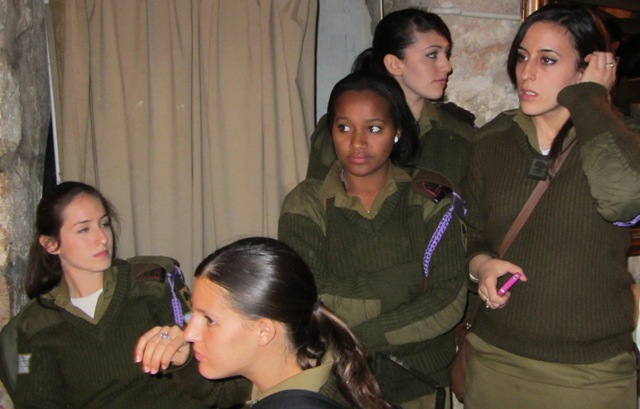 In the cafe where we sat, were about 75 beautful young soldiers who had their rifles resting on the backs of the chairs. 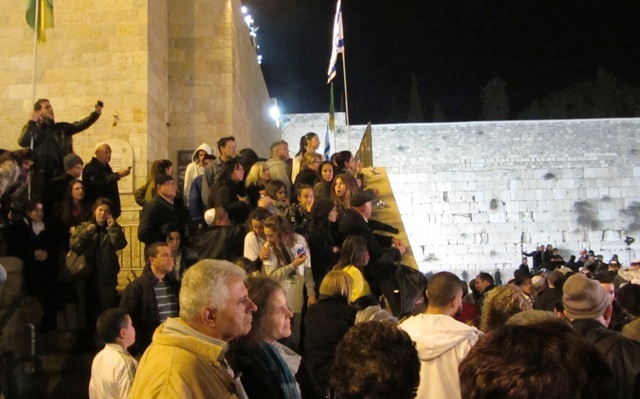 It occurred to me that in the US – I could never sit comfortably with so many young people with rifles near by. 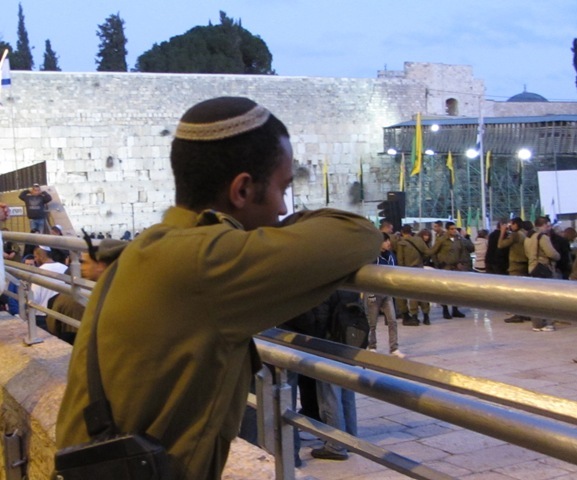 But here, in our holy Israel, we could sit as tourists and enjoy the coffee, not being afraid. We are so blessed to have such brave, committed and beautiful young people serve our country. Beautiful comment Toby! Thank you. 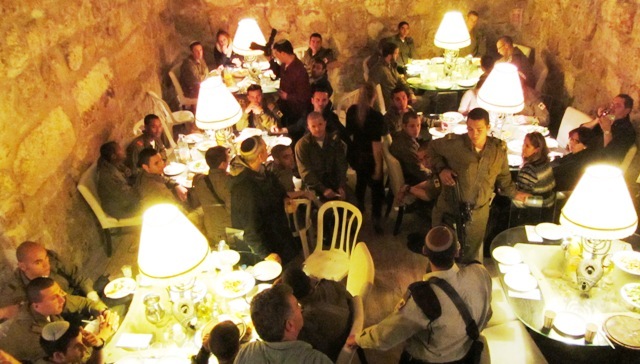 After the ceremony young soldiers were in the restaurants all around the area. Around ’92 in Athens, there were soldiers in the airport armed with rifles and I was not comfortable. Ok, you win. I always think that I am a bit of a noodge when I write. I get carried away but YOU did it this time to me. Just the sight of our beautiful, young “sons” gathering together to swear allegiance to our country brings tears to my eyes. 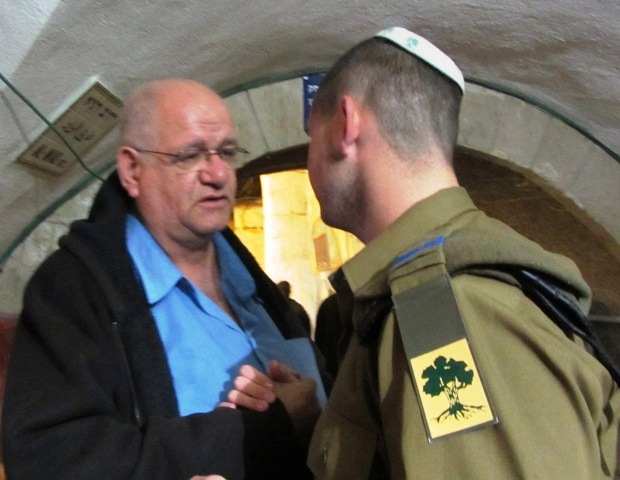 You showed the apprehension on faces of beautiful Israeli men and women, the mixing of cultures and colors, all blended together with one purpose to protect our land and its people. How can we not love them and pray for their safety. Your photo of the green light on walls and arches reflecting on the proud green berets of our children is beautiful as well. 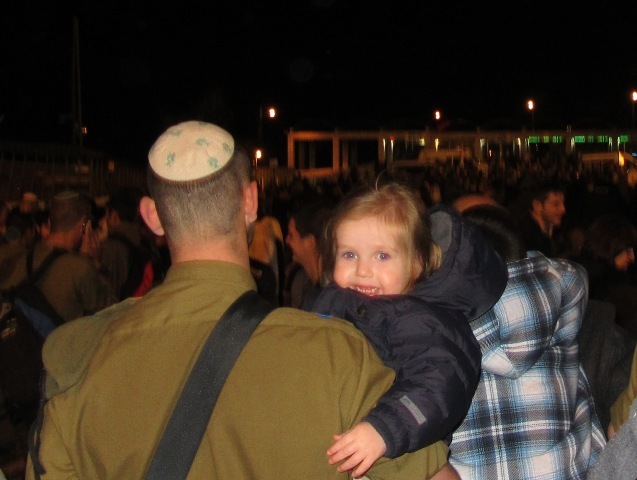 My daughters were in the army and my son in the navy and I will never forget the sigh of relief and “todah HaShem” when they walked safely through the door at weekends. 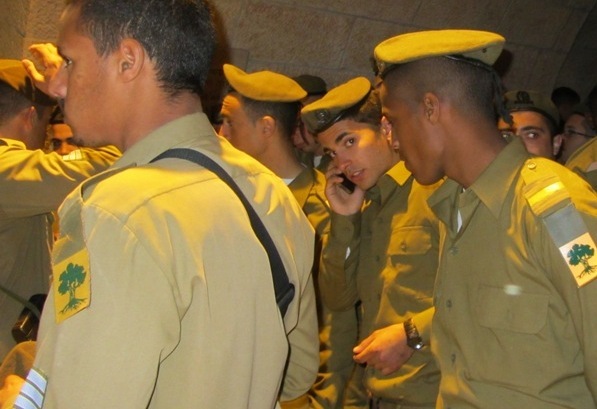 Their jokes and laughter with family and friends around the Friday night supper table and the pride, and respect the country has for our young soldiers who all play their part serving our beautiful Israel.